Should You Do an Apple Cider Vinegar Cleanse? A hard look at the science around apple cider vinegar benefits for weight loss, heart health and blood sugar. Plus, is there a healthy way to add this drink to your diet? Detoxes are definitely "in." And apple cider vinegar cleanses have become the new must-do detox. A mixture of apple cider vinegar with a variety of spices and juices (e.g., cinnamon, honey, ginger, cayenne pepper, lemon juice), this cleanse has been sweeping the internet as a beneficial cure-all to help you lose weight, lower your cholesterol and blood pressure, control your blood sugar, boost your immune system, relieve constipation and even regulate body and skin pH. But before you jump on the apple cider vinegar cleanse train, let's see what the latest science has to say about these proposed health perks. Weight loss in a bottle? Maybe—if the sour taste ruins your appetite. This claim hinges largely on a trial done by Japanese researchers in 2009 that took 155 subjects and randomly split them into three groups with a prescription of a daily drink containing either 1 tablespoon or 2 tablespoons of apple cider vinegar, or a placebo. After 12 weeks, the comparison (placebo) group had not lost weight, while those assigned to drink vinegar had lost 2 to 4 pounds—all while keeping their diet the same. This isn't a great deal of weight loss in three months, but the authors suspect that acetic acid, a major component of apple cider vinegar produced when the sugar in apples ferments, may have been working to suppress enzymes that harbor fat, a mechanism extrapolated from animal studies. Apple cider vinegar cleanses are also said to be satiating, which, if true, could help with weight loss. Past research suggests that downing this sour drink slows gastric emptying (the speed at which food moves from the stomach to the small intestine during digestion). The vinegar's acidity, according to the researchers, could activate low-pH sensors in the intestine that halt the propulsion of food from the stomach. "And slowing down digestion could mean feeling full, faster because there won't be as much room to store incoming food in the stomach," says Rahaf Al Bochi, R.D.N., L.D.N., owner of Olive Tree Nutrition and spokesperson for the Academy of Nutrition and Dietetics. But to our knowledge, only one study, published in 2007 by Swedish researchers, gives modern backing to this age-old claim. Ten patients with type 1 diabetes consumed a large serving of rice pudding with either 1 cup of plain water or 1 cup of water plus 2 tablespoons of apple cider vinegar. Their gastric emptying rates were measured using ultrasound technology, and researchers found that participants who drank the vinegar had significantly slower gastric emptying rates than those who drank water alone. But whether that result translates to weight loss is yet to be determined. Controlling your blood sugar is important for more than keeping type 2 diabetes at bay. Emerging science is pointing to dramatic fluctuations in blood sugar as a major cause of chronic inflammation that can lead to a host of other issues, including heart disease and cancer. And at first glance, an apple cider vinegar cleanse seems to be a promising tool in this mission to control blood sugar spikes and reduce chronic disease. Subjects who consumed 1½ tablespoons of vinegar (either apple cider, white or wine) with a meal significantly lowered their post-meal blood sugar compared to those who did not drink vinegar, reports a 2017 analysis in Diabetes Research and Clinical Practice How does this work? Test-tube and animal studies suggest that acetic acid may increase the uptake of glucose by the body—getting it out of the blood—and may even block absorption of carbohydrates by reducing how much is broken down during digestion. However, these mechanisms have little evidence in humans. "There are a few studies to suggest vinegar helps with insulin sensitivity or lowers post-meal blood sugar, but these studies have very small sample sizes," says Al Bochi. "So it's really hard to recommend their use for the whole population." Ergo, vinegar's effect on blood sugar is far from being definitive. But what about cinnamon, a common cleanse ingredient dubbed the "best spice for balancing blood sugar"? Cinnamon in supplement form (ranging from 120 to 6,000 mg per day) has been shown to significantly reduce blood sugar in those with type 2 diabetes, according to a recent review in the Journal of the Academy of Nutrition and Dietetics. The doses studied, however, are much higher than you would find on an ingredient list, and only four of the eleven included studies found clinically significant, yet still modest, improvements in fasting blood glucose and HbA1c, a measure of long-term glucose regulation. "There's no harm in using cinnamon in your baking or cooking," notes Al Bochi, "but I wouldn't necessarily jump on using cinnamon in a cleanse to replace a healthy diet or medication use." Keeping your cholesterol in check is a great step in reducing your risk of heart disease. Animal studies suggest that apple cider vinegar promotes the oxidation (breakdown) of fats, including LDL cholesterol and triglycerides that can build up in the walls of arteries if levels are too high. When vinegar is added to the diet of animals fed high-cholesterol diets, their bodies produce more of an enzyme that breaks down fat and suppresses a subsequent rise in triglycerides. And, although there's buzz about cayenne pepper or other spices lowering blood pressure (they're popular ACV mix-ins), the evidence remains to be seen. There's no hard-evidence that puckering up to this sour cleanse eases irritable bowel syndrome or constipation, or provides immune benefits. And while delicious spices and ingredients like honey and lemon juice are not bad for you, their benefits may be over-hyped, with little scientific evidence at the moment to back their disease-fighting claims. As far as balancing pH or "detoxing," our body already does a good job of that on its own. We have natural ways of removing toxins without dramatic cleanses. "That's ultimately the role of the liver, to help with the natural detoxification process," says Mary Wirtz, R.D.N., L.D.N., of the Mayo Clinic Healthy Living Program. "And because we have a natural detoxifier that's able to break down harmful substances and excrete them, I would always be hesitant to recommend an apple cider vinegar cleanse—or other detox products out there." Plus, the pH of our tissues and blood is tightly controlled to keep the proteins in our body functioning correctly. And for good reason: major fluctuations in pH mean major health issues, such as diabetic ketoacidosis, that are beyond the fix of home remedies. Keeping a healthy, well-rounded diet can make it easier for the body to perform these functions, but there are no specific foods to alter one's pH. "It's important to remember that with these fads—these crazes—there's a lot of unknowns," adds Wirtz, "and people fail to realize that these things can actually harm your body." Vinegar can irritate the lining of your throat, stomach and digestive tract, especially when taken on an empty stomach, and may create acid reflux-like symptoms. Plus, there's no evidence that frequent use is safe long-term. Apple cider vinegar may also interfere with some medications, so consult a doc before making it part of your routine. 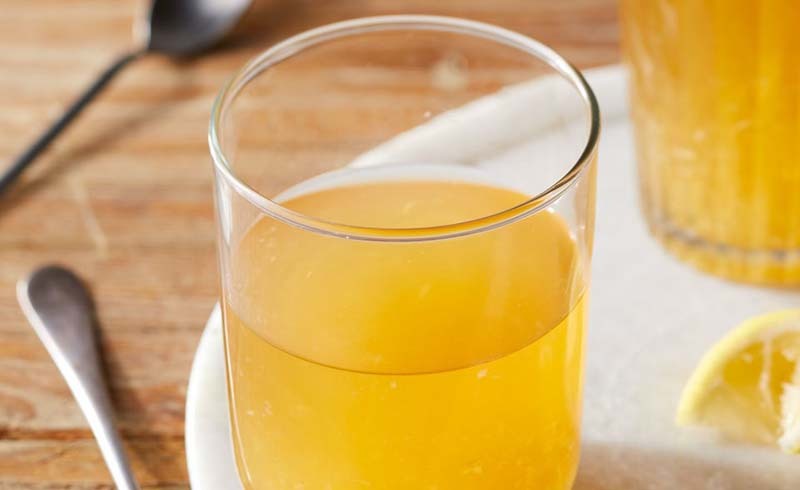 Apple cider vinegar has been around for years, and this tart drink has now been rebranded as a cleanse to give an old fad a new face—and make it easier to stomach. But the health benefits of downing apple cider vinegar have not been fully fleshed out by research just yet. And the risks may outweigh any potential benefits. While the other ingredients on this cleanse's menu are not harmful, just be realistic about the health benefits you will gain. "You can have vinegar on salads or use spices in your cooking, but there's no conclusive evidence to really say that these foods will give you the benefits you seek," says Al Bochi. If losing weight and controlling blood sugar spikes are top priorities for you, stick to a whole-food—and more sustainable—solution by swapping out processed foods and foods containing simple sugars (think chips, cookies and white bread) for a nutrient-dense, well-rounded plate of whole grains, lean meats and lots of veggies. U.S. Daily News: Should You Do an Apple Cider Vinegar Cleanse?